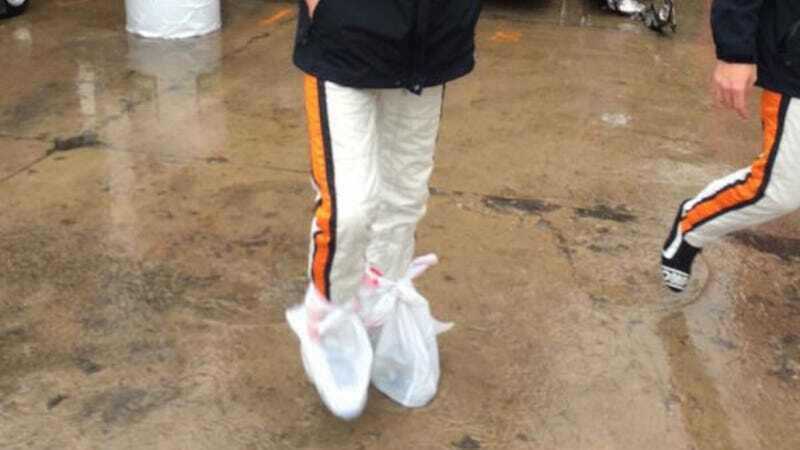 There’s nothing worse than wet shoes in a race car. It’s the reason why you see racers dangling their feet out of the car asking if someone can squeegee off the bottoms before a wet race. Wet shoes are miserable. Fortunately, Pirelli World Challenge racer Kévin Estre has this problem figured out. The series is waiting until 11:00 AM to decide if they’re racing on the wet Belle Isle Grand Prix course today. While the rain in Detroit isn’t particularly heavy, it is a street course, and street courses tend to have poor drainage. Update: Race 11 has been cancelled due to the wet conditions.